SIX MONTHS AFTER DOOMSDAY with Superman believed dead and his body yet to be found, Earth is vulnerable to a threat from a new alien attack… then unknown Supermen begin to appear who may yet prove to be far from friendly in the highly watchable animé Reign of the Supermen. Along with the rest of the world, The Daily Planet has been rocked to hear of the death of Superman (voiced by Jerry O'Connell: Carter; Bravo's Play by Play; Stand By Me), leaving an enormous gap in Earth's defence system. Without Superman, who will protect Mankind? Nobody has seen Superman's body and a grieving Lois Lane (voice of Rebecca Romijn: X-Men; The Librarians) is still clinging to the hope that he is somewhere in the Universe and that he will return to Earth. Lois is sent to cover a story about the new supermen and seeks out Wonder Woman (Rosario Dawson: Sin City; Rent; Daredevil) from the Justice League, but the Amazon can tell her nothing of Superman's fate. The Justice League  Batman (Jason O'Mara: Man In The High Castle; Terra Nova), The Flash (Christopher Gorham: Covert Affairs; Ugly Betty), The Green Lantern/Hal Jordan (Nathan Fillion: Castle; ABC's upcoming The Rookie), Wonder Woman and Steel  are aware that terrible things are coming, and they unite to fight a new über-powerful enemy but are quickly neutralised. What hope now for Earth? 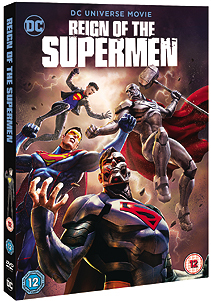 To be in with a chance of winning Reign of the Supermen on DVD tell us in what year Superman first appeared in a comic. Only one entry per person. Email your answer to win@motorbar.co.uk before the closing date of 14th April. Please also make sure you put 'SUPERMAN' in the subject line and include your name, age, address, and a contact number.